You and me both Elvis, you and me both. I can’t stop going to Vegas, and I won’t! I just love it, there is so much to do and see. I know some people get burnt out or don’t love it like I do but I just feel like there is always new restaurants, shows and experiences to have each time, every trip is unique. This was the longest chunk of time I have ever been, we went for 10 days. That seems really extreme, but the first couple and last couple days were just Ryan and I and it was really relaxed, we went to the pool and went to dinner and just relaxed and walked the strip. It also helped that we stayed at Vdara, which is our favourite hotel. It is all suites, so lots of the time we had breakfast in our hotel room and there is no casino so it is a lot more chill. In the middle part of the trip good friends of ours, Ryan and Lisa, met up with us. He had never been before so we tried to show him some of our favourites and it was very go, go, go. I had such a great time, it was probably one of my favourite trips. Ryan and I always try to travel on the 5:30 to 7:30 pm flight from Edmonton to Vegas and then we have the rest of the night in Vegas but you don’t have to get up at the crack of dawn to catch your flight, and truth be told I’m pretty unpleasant when I am over tired! 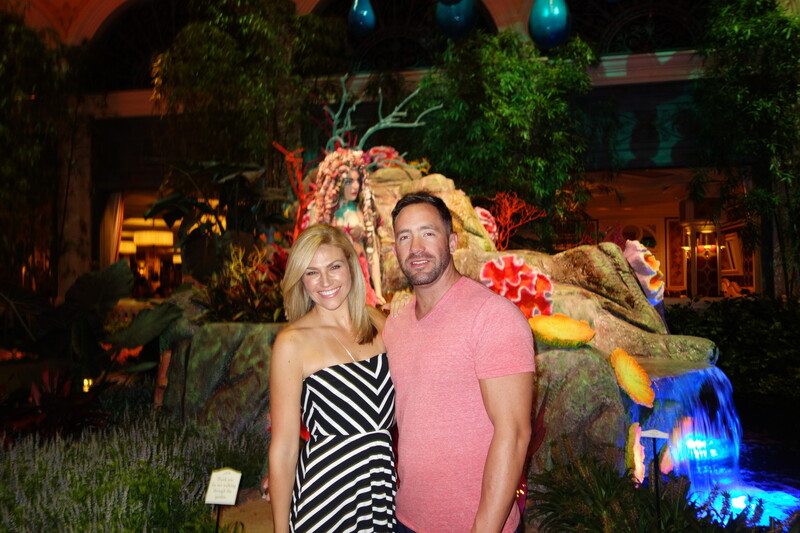 Once we arrived and checked in we went to dinner at Blue Ribbon Sushi at the Cosmopolitan. It was delicious and we sat at the sushi bar which was really fun, sushi is one of my favourite foods ever! We then walked the strip for a bit and checked out the Bellagio gardens, which I always like to do, it’s just so gorgeous. 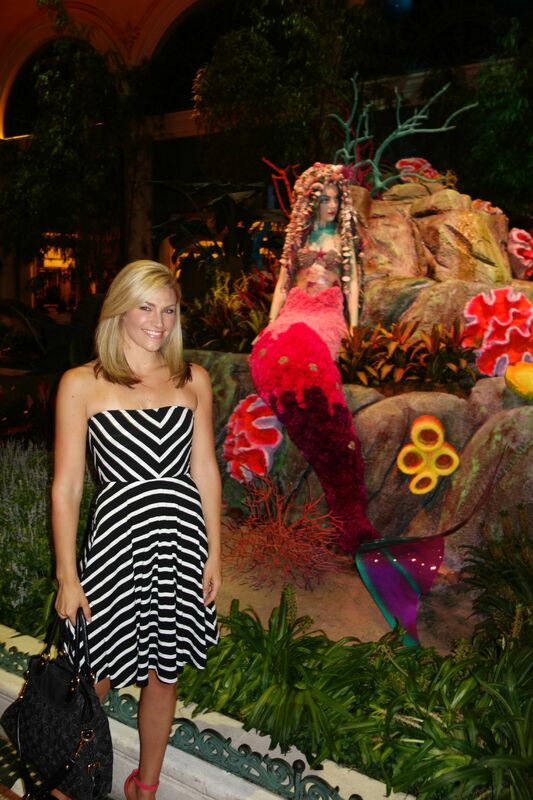 This was an under the sea theme and it was one the best I’ve ever seen – and I’ve been a lot! We spent the next day at the pool, we rented a day bed which we love to do because it is kind of away from the crowd, still close to the pool and way more comfortable and roomy. We also did a little shopping at the outlets and that night we had plans for dinner and a show, neither of us had seen a magic show in all the times we have been to Vegas so we went to David Copperfield. It was cool, and the things he does are definitely mind boggling and amazing, but I don’t know if I would spend that kind of money on a show like that again. We tried dinner at Julian Serrano at Aria, it is Spanish tapas and we would definitely recommend it. You order a variety to try and we got the Mediterranean chicken skewers, the beet salad, the Spanish charcuterie platter and the coco espinacas which is a goat cheese and spinach flatbread. 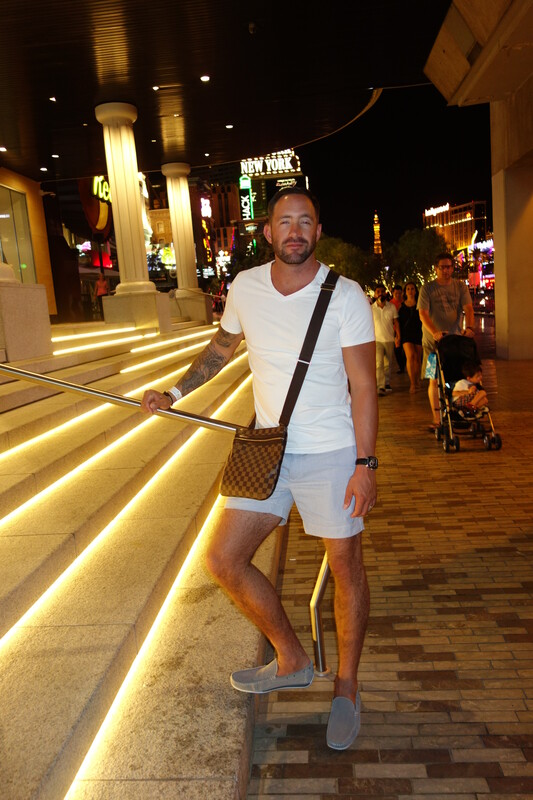 We had fun walking the strip that night, grabbing drinks and joining a big group dance party on the bridge at New York New York. I was really feeling my husband’s look this night! The next morning our friends Ryan and Lisa arrived and we greeted them at the airport with open beer! Ryan could not get over the drinking out in public and in the street the whole time he was there. I hope we showed them a good time and they want to go back with us asap! 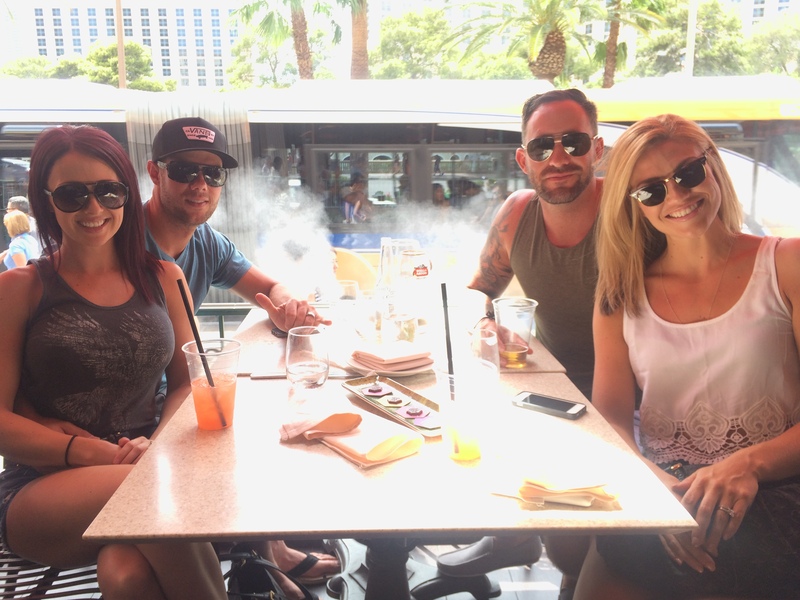 After checking them into the hotel we went for a walk on the strip and went to lunch at Hexx, which is at Paris. The location is so great, we sat on the patio which has a great view of the Bellagio fountains. It’s a really casual vibe with a large menu and some really fun drinks; Lisa and I split the “Springtime Spritzer,” super refreshing and filled with dry ice so it was steaming the whole time. We spent the rest of the day grabbing drinks (or brinks as we now fondly call them – drinks you can bring with you!) and showing Ryan some of the sights. I was really giving off some Britney Spears circa 2002 vibes on this trip with all my crop tops! That night we went to Holstein’s at the Cosmopolitan, our friends are crazy for burgers. It’s pretty fun there, our server was great and they have an insane menu of boozy milkshakes. We all shared the Fat Boy which is candy bar vodka, reese’s pretzels, sprinkles, cap’n crunch, oreo cookies, and butterfinger all in a shake! After some serious digesting we got ready to go out and went to Omnia where Afrojack was the DJ for the night. Ryan and I had both been there when it was Pure nightclub and they did a huge renovation, it is awesome in there now, so much different. I brought out my second crop top of the day to go out! My long, grown out and heavy bangs are a constant struggle, I’m always looking for new and cute ways to pin them, twist them and braid them. This dutch braid was so easy, lasted all night and was perfect for the heat. Boozy times with these little gems! The next morning after slowly making out way out of bed we headed to the pool where we had a cabana reserved for the day. I personally love having a cabana because the heat is so outrageous, it was about 38-42 degrees the whole time we were there. We spent the day lounging, floating in the pool and sipping poolside cocktails, it was a really fun and relaxing. That evening we went to Rhumbar at the Mirage, we originally wanted to go there because they have a cigar menu and my husband loves them. But the also have a big menu of hooka, which I had never tried before and we settled on the grape flavour. We went out off the strip, had numerous libations and ended the night with pizza from Pin Up Pizza at Planet Hollywood. I’ve never been so off the diet wagon! I love the fuscia colour of the romper I wore that night, I think next time I might add a belt to break it up. The view from our suite was incredible, we were on the 51st floor. This was just the first half of the trip, so much more to come!